I have a 1.6m dish and stand that came with a connections satelite system some years back. The dish is spun aluminium and in good condition although the stand is going to need quite a bit of work, is it worth going to the trouble of rebuilding the stand and no doubt it will need a more modern lnb and some modifications to the mounting system.The question is what can i receive on a 1.6m dish here in the u.k. and is it all worth the trouble? A 1.6m dish is an odd size. Do you have any pictures and history on it? Definitely worth refurbing the dish and the mount - you'll have a lot of fun with it and get many satellites that are not available on smaller dishes, including a foray into C band. What content are you interested in? Connexions equipment is well over 25 years old, you will need to take image of the dish reflector and feedarms to verify it is straight and can accommodate modern LNBs. You might have to change more than just the electronics. Ok thanks.....i'm not really sure whats available in the u.k. are there any film, documentary type of channels any ideas appreciated..i do have a humax free to air receiver hooked up to a sky dish and a few other receivers around including the original connections one which i guess is just old hat now. The dish bolts to quite a substantial circular steel frame that pivots on the lower frame which would no doubt keep the dish in shape, i dont think theres any damage to the dish and its been stored inside whilst the stand has been in the garden and will need shot blasting and some new pieces of angle welded in.....i have the support arms and lnb and i could always make the arms longer to accomodate a new lnb of some description...? Photos will help us out a lot.......And see if you can get/make/find a polar mount and actuator that will fit that dish, this way you can surf the Clark belt and get a ton of channels. Satbeams.com is a good start you can see whats available to you from your Eastern horizon to Western horizon. 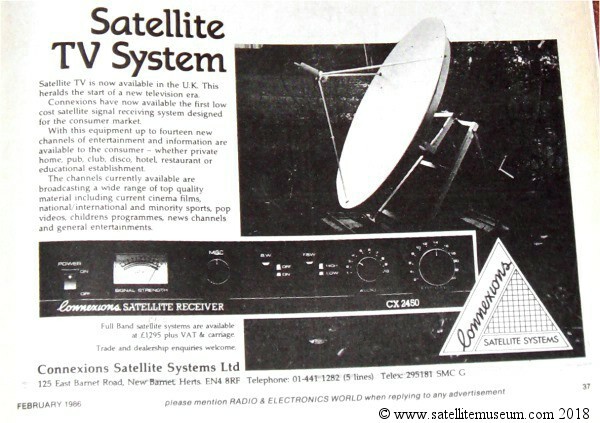 Image courtesy of the Satellite Museum. I have over 3800 Ku band TV channels with an 88cm dish & the SX88+ Multi-Stream receiver 53 east to 30 west + a few more with the 100cm dish from 26 east 21.5 east,7.3 west & 8 west. Interesting old LNB, I can make out the year of 1986 of the label. It might be possible to attach a universal LNB to the feed arrangement, it does not look that different from a C120 feed? Pictures of both ends of the feed arrangement would be useful to get an idea of the type of flange and feed aperture? It looks like the slightly shiny collar on the LNB fits into a recess on the feed support arm holder and is held in place by the rusty bolt? Theres 3 support arms that screw onto the threaded holes, the screw was just to hold the lnb and give a wee bit of adjustment. SPC was a well known supplier in the late 80s. Since the images do not show a polariser there should be a waveguide transfer of some sort between LNB and feed, possibly still bolted to the item itself. Anyhow I would suspect the feed needs replacing as it would be tuned to 11GHz rather than the full band. You will also need a new run of cable into the house as it will be 50Ohm and have an N connector on at least one end. I'll make a start on the stand, probably a new lnb and feed horn.....i think we used to go outside and rotate the lnb to receive vertical or horizontal polarised signals. I guess a satmeter will be on the cards too, i have an old style meter but it doesn't identify the channels? You won’t need anything more than a basic meter to set up/check the arc. All you want to do is ensure you get signals across the arc. Spend your money perfecting the dish.